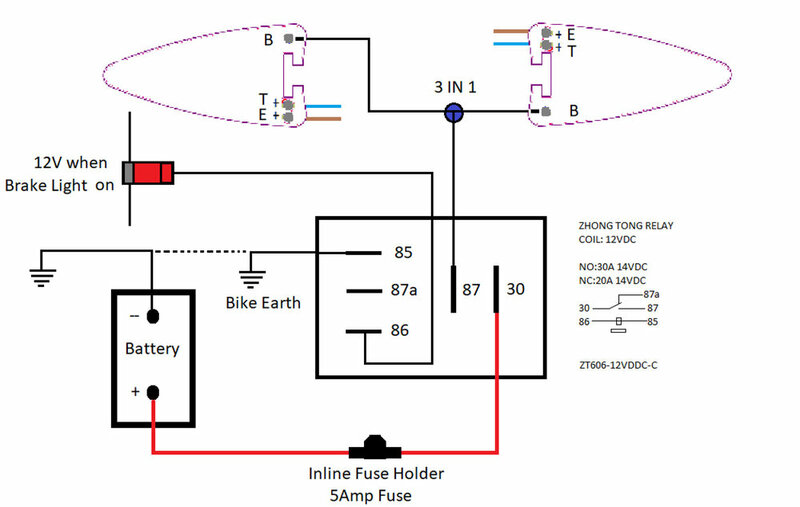 Installation is quite straightforward, but does require the installer to have a good understanding of the auto electric systems on their bike. If, at any stage of the installation process, you do not fully understand what is required, then we recommend you seek the assistance of a qualified auto electrician or your local bike shop. The model and year of your bike will determine the type of installation most suited to it. The latest bikes that use the CAN bus wiring system normally need to have the brake lights installed using a relay, so that the CAN bus system does not flag up any faults. Many earlier bikes can be installed without this. Please note: the photos used in these instructions are for reference only. The turn signal housing shape will vary dependent on the upgrade model you have bought. A small Philips screwdriver to remove the lens retaining screw. Electrical wire cutters and strippers suitable for 20AWG wire. Spanner/screwdriver to remove the battery terminals. 2x wires marked 'Weiser' at one end and '3-in-1 at the other end. These wires will join together using item 7 and item 3 to provide the power to your Weiser brake lights. 1x relay. The relay takes power direct from the battery and switches it to your Weiser brake lights/turn signals to ensure the CAN bus will not flag any faults. 1x wire marked 'Relay 87' at one end and '3-in-1' at the end. This wire will take 12v from the relay to join with item 1 to provide the power to your Weiser brake/turn lights. 1x wire with fuse holder marked 'Relay 30' at one end and 'Battery +Ve' at the other. This is providing the +12v to the relay so that it can be switched to your brake/turn lights when the brakes are applied. 1x wire marked 'Bike Earth' at one end and 'Relay 85' at the other. This wire provides the -VE to the relay. 1x wire marked 'Relay 86' at one end and is unmarked at the other. This wire connects the relay to the +12v supply that provides power to the brake light using the Posi-Tap (item 8) provided. 1x Posi-Twist connector - see instructions on how to use this also on this page. 1x Posi-Tap connector - see instructions on how to use this also on this page. 1x 5 amp fuse - do not fit any other value fuse. 5x tie wraps - use these to secure the wires you are installing as instructed. 2x locking keys for securing the turn signal housing (not an essential requirement). The blue Posi-Twist connector has two halves. Strip the insulation back half an inch on each wire and insert them through the hole in the male section. Then screw the cap back on. The Posi-Taps have two ends that unscrew. The grey end has a slot to slide over the wire you are connecting to. The red end has a hole to push the wire you are adding through. The center portion has two ends. One has a point for piercing the insulation of the wire you are tapping into. The other has the point blunted which connects to the wire you are adding. With the grey end slid over the source wire, thread the center pointed end until it is snug. Push the stripped wire you are adding through the red end of the Posi-Tap and thread it onto the blunt end. The first task is to decide on the location of the relay and the inline fuse. When installing the Weiser 2-in-1 Brake Light/Turn Signal Upgrades a good location is the area close to the battery, which also makes for a neater installation. You will need space for the relay and fuse holder. Open the turn signal housing by removing the single screw. Carefully remove the bulb and reflector assembly, and unplug the two wires. The bulb holder assembly that was removed incorporated a locking key that prevented the turn signal housing from separating from its stem. Within the installation kit is a new locking key (item 11), which should be inserted in its place. (The locking key that best fits your flasher unit is included in the fitting kit.) Ensure the key is pushed fully home, so that the lens will fit back in position correctly. Feed the plain end of the wire (item 1) marked 'Weiser 3-in-1' into the hole where the two existing turn signal wires run, leaving approximately two inches of wire in the housing (about the same length as the existing wires). Locate the wire that you have inserted on the inside of the indicator stem. Repeat stages 1 to 3 on the other turn signal housing. As both brake lights need to operate at the same time, take the wire from the right turn signal and feed it across to the left turn signal, ensuring the wire does not foul any moving parts or is not near to any item that may get hot when the bike is running. Use cable ties (item 10) to secure the wire neatly in place. The two wires now at the left turn signal will need to join to the wire (item 4) in stage 6. Using the wire marked 'relay 87' - '3-in-1' (item 4), connect the wire onto the relay terminal 87 - see the circuit diagram shown for pin numbers of the relay. Locate the relay in position you have allocated. Rout the wire from this location to meet the two wires you have installed at stage 5. When routing wires on the bike, it is always best to follow the rout of existing wiring, avoiding any items that will get hot when the bike is running or any moving parts. Secure the wire in place using the cable ties (item 10). The three wires need to be joined together using a Posi-Twist connector (item 7). Instructions on using a Posi-Twist are included on this page. Disconnect the wires that are connected to the -Ve of the battery and position them so that they cannot accidentally reconnect as you perform the next stage. Using the inline fuse holder (item 4), connect the ring terminal end marked 'Battery +' to the battery +Ve terminal. Take care not to let any part of the tool you are using touch the bike earth. DO NOT FIT THE FUSE AT THIS STAGE. The connector on the other end of the end of the cable should be fitted to 'terminal 30' on the relay. Using the wire marked 'Bike Earth' at one end and 'Relay 85' at the other (item 5), connect the Relay 85 end to the relay terminal 85 - see wiring diagram to confirm the relay terminal numbers. Then the ring connector on the other end of the wire to either a convenient earthing point on the bike or to the '-Ve terminal' on the battery. The existing wires to the -Ve of the battery can now also be reconnected. Using the wire marked 'Relay 86' on one end (item 6), connect to the relay terminal 86. The plain end of the wire needs to be connected to the +12v supply that supplies the brake light. On most bikes, the most convenient place to make this connection is at the rear brake light. To do this, rout the wire from the relay to the brake light. Rout the cable with existing cables on the bike keeping it away from any parts that may get hot when the bike is running and from any moving parts. On the rear of the brake light bulb holder, identify which of the wires that feed the brake light. Check this is correct by turning the ignition to the first position, and determining which wire has the 12v present only when the brake is operated. The connection to this wire is made using a Posi-Tap connector (item 8). Using the wiring diagram and the instructions above, check that all the wires have been installed correctly. If possible, get the wiring checked with a second person. To reduce the risk of static damaging the Weiser brake lights ensure that you touch a metallic earth point on your bike. Do this immediately before the next stage as it will reduce any static that might have built up. Remove the Weiser brake/turn signal unit from its packaging, ensuring that you only handle the edges - do not touch or press down on the LEDs or the electronic components on the board, as this will cause damage to the unit. Connect the blue wire to the 'terminal T', the brown wire to the 'terminal E' and the new Weiser wire you installed to the 'terminal +'. Refit the board into its housing - again taking care not to touch the LEDs or electronic components - and refit the lens. Take care not to over tighten the screw. Insert the 5 amp fuse into the fuse holder and fit the cover. Turn the ignition key to the first position and operate the brake. Both of the Weiser brake light/turn signals should light up red. Start the bike, the Weiser brake light/turn signals should be off. Set the turn indicator to the left and then to the right - the relevant Weiser brake light/turn signal should flash amber. Holding the brake on, both Weiser brake light/turn signals should show red. Still keeping the brakes on, set the turn signal to the left, the red brake light should go off and then flash amber, whilst the right turn signal should remain red. Repeat this exercise with the right turn signal. Finally check that with hazard lights on both Weiser turn signals flash amber.